This highly rated coffee table book would be a welcome addition to any collector's horror collection. It covers movies made from 1923 to 1968. "A Monster Science Created - But Could Not Destroy!" To celebrate the 75th anniversary of the movie Frankenstein, Sideshow has created a Life-Size Bust of Boris Karloff as the monster. The bust is 21 inches in height, in full color recreating the Jack Pierce make-up, and uses high-quality fabrics to reproduce part of the original classic costume. Each piece is hand cast in fiberglass and mounted on a decorative base which is then individually hand-numbered. This Universal Classic Monsters Series Life-Size Bust would be an excellent addition for any serious collector of Horror memorabilia. "Since its inception in 1994, Sideshow Collectibles has been a specialty manufacturer of licensed and proprietary collectible products that reflect a passion toward creating unique, highly sought after figure collectibles, as well as film prop replicas and fine art collectibles. The Sideshow artisans are renowned sculptors, experienced model makers, painters and costumers, whose collaborative efforts result in intricately detailed likenesses of popular characters, including film and television monsters, villains, heroes and mystical creatures of fantasy, as well as legendary figures from history. Sideshow artisans have regularly distinguished themselves for their ability to achieve a level of authenticity seldom seen in the figure collectible arena. In 1999, Sideshow began marketing its own line of collectible and specialty products under the Sideshow brand, beginning with the Universal Classic Monsters 8" Action Figure license. Quickly recognized as a quality manufacturer, Sideshow products have been highlighted in national trade and specialty toy publications where their Action Figures, 12" Collectible Figures and polystone collectibles have been awarded 'Best of the Year' by various trade publications." For more information, click on "Sideshow Collectibles" in the sidebar. 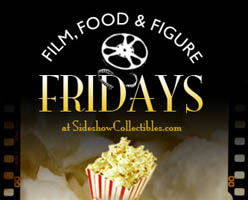 "One Friday of every month, Sideshow is giving away a DVD, a bag of popcorn and a figure to one random winner!" This month's prizes include the Clerks II DVD and a Kevin Smith Inaction Figure ... both autographed by director Kevin Smith. Contest begins at 9am PST today and runs until 6pm PST. Click on Sideshow in the sidebar and follow the instructions for your chance to win!